The beauty of an American or person from the UK who retires in Ireland is that we speak the language, more or less (excepting Gaelic). The people and their names seem so familiar. Killarney on the Ring of Kerry is a small city with many amenities including restaurants, a very walkable downtown, and some world class golf courses. It would make for a great place to retire where there would be plenty to do. In fact it was the number # international place to retire on our 2013 list of the "Top 10 International Places to Retire". There are countless small villages both on the coast and in the countryside that would also make great places to retire. Towns in the west like Lahinch, Doolin, Waterville, Tralee, Dingle, and Ballybunion are charming with many pubs and restaurants, small shops, and quiet neighborhoods. The towns we mention will be quite familiar to golfers; some of the world’s great public golf courses are located in these towns. 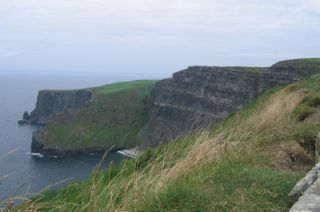 (Photo: Cliffs of Moher on Ireland’s west coast). Galway is another town that people mention for retirement. Ireland, the so called “Celtic Tiger”, was tamed a bit with the spectacular economic collapse that started in 2007. The silver lining of the collapse is that real estate prices are much more realistic than they were during the run-up. Establishing residency and visa. Establishing residency in Ireland is not as difficult as some countries, but not that easy either. There are multiple ways to use your finances to get a residency. It is relatively easy for Americans to reside here if you, your parents, or your grandparents were born here. Even if that is not your case, you can probably also qualify for a “permission to remain” residency if you can prove you can support yourself. Another option might be to buy a residential property in Ireland where they intend to live in (but not for rental income). There is a minimum €950,000 mixed investment consisting of €450k in property and €500K in immigrant investor bonds. See this link at the inis.ie for more. You do not need a visa to stay in ireland for up to 3 months. Here is a link to the Irish Immigration and Naturalization Service. Medical. Modern medical facilities and highly skilled medical practitioners are available in Ireland, but due to high demand, access to medical specialists and admissions to hospitals for certain non-life-threatening medical conditions may result in extensive waiting lists. Medicare is not accepted in Ireland. Residents of the EU will probably be covered to some extent, but you should research that. There is an active market for private health insurance. Crime and Security. This is from the U.S. State Department: "Ireland has a relatively low rate of violent crime. Petty crime and residential crime is much more common, especially in urban and tourist areas. Rates for residential break-ins, theft, burglary, and purse-snatching have all risen in recent years, and thieves often target rental cars and tourists, particularly in the vicinity of tourist attractions. In rare cases, these crimes have involved physical assault or violence, more commonly in Dublin." Taxes. Residence status for Irish tax purposes is controlled by the number of days you are present in Ireland during a given tax year. You will be considered a resident if you spend more than 183 days in a tax year, or 280 days over 2 years. Ireland has double taxation agreements with a number of countries including the U.S. and UK (in which case you will usually only be taxed in one country). See IrishAbroad for more. Cost of Living. The numbeo.com price comparison (CPI plus rent) shows Ireland with an index of 59, vs. the U.S. with 57 and UK at 60. The Local Purchasing Power Indices are quite similar. If accurate, this comparison makes it appear that retiring to Ireland is about the same on a cost of living basis to retiring to either the U.S. or the UK. Weather. Ireland has better weather than you might think. It does rain frequently in the winter and spring, but it does not get particuarly cold, thanks to the Gulf Stream. You can even find palm trees on the southern coast. Locals play golf throughout the year. Best Places to Live. Ireland has many, many nice villages, towns, and cities to retire in. The coastal areas are especially beautiful. See the list of Irish towns which we have reviewed in the top right column. Pluses and Minuses. The lifestyle is very attractive as the country is filled with lively people who enjoy life. The scenery is great as is village life. It does seem to be somewhat expensive, however, relative to other alternatives.